Inspired by the blockbuster HBO television show and featuring the programs biggest stars comes the new Vikings slot machine from NetEnt! Join forces with a famous Norse clan from the dark ages of Scandinavia as they invade England and France for silver and gold. 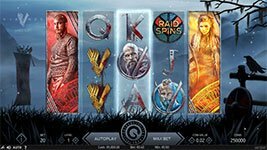 This exciting game is set atop a 5-reel 243 ways layout in normal mode that expands to 7-reels and 78,125 ways to win in Raid Spins. There are plenty of opportunities to plunder fortunes in Vikings! Hot Spot Feature – In the main game, there is a Hotspot that covers Reel 3. When a fully stacked Viking symbol lands completely in the Hotspot area, all other Viking symbols in the play area outside the Hotspot are transformed into the Viking symbol that landed in the Hotspot. Any one of the 4 symbols with a face on it is a Viking symbol. Scatter Pays – When a fully stacked Viking symbol lands completely in the Hotspot, Scatter Pays is activated. After the characters have transformed into the same Viking symbol, the win is evaluated in accordance with a payout scheme available in the paytable. Shield Wall Feature – In both the main game and in Raid Spins, the Shield Wall appears as a cluster of mystery symbols that appear on random areas of the reels. Once they have appeared, all wins are evaluated. Raid Spins – Three Raid Spin symbols appearing on reels 3, 4 and 5 in the main game activate Raid Spins. In Raid Spins, the game transforms into a 7-reel, 5-row game with 78,125 ways to win. Seven Raid Spins are awarded with three Hotspots on reels 3, 4 and 5. When a fully stacked Viking symbol lands completely in one or more of the Hotspot areas, all other Viking symbols in the play area outside of the Hotspots and inside the Hotspots are transformed into the same Viking symbol that landed fully stacked in the Hotspot area.